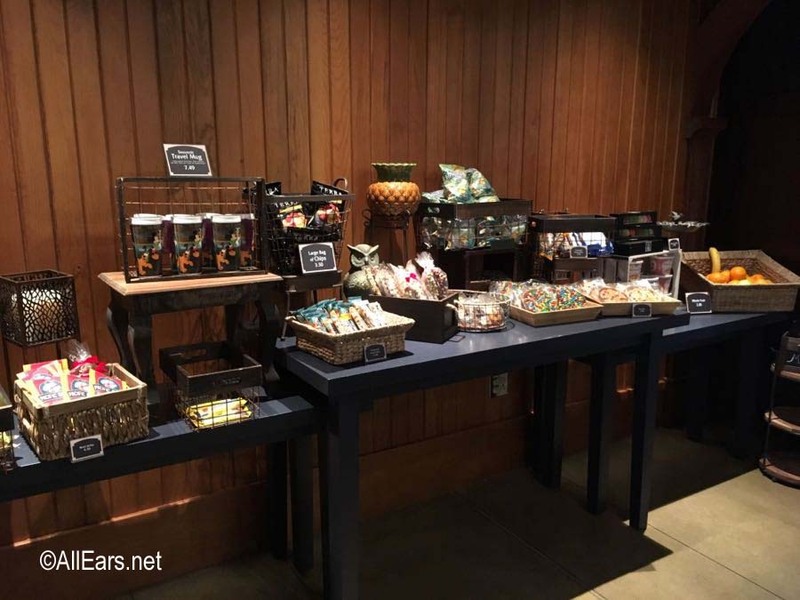 White Water Snacks, the quick service restaurant at Disney’s Grand Californian Hotel & Spa, reopened recently after a several month refurbishment. The restaurant has a sleeker, more streamlined look, as well as some additional, more upscale, menu items. The restaurant’s location in the corner of the Grand Californian Hotel near the hotel’s entrance to Disney California Adventure park makes it a convenient place to visit. 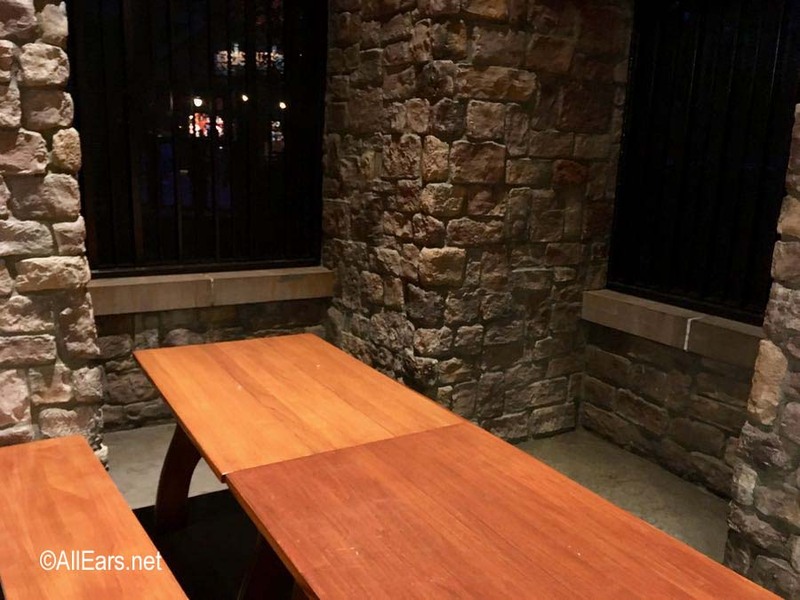 It’s also very pleasant for a quiet and relaxing meal away from the theme parks, especially if seated at one of the patio tables outside. 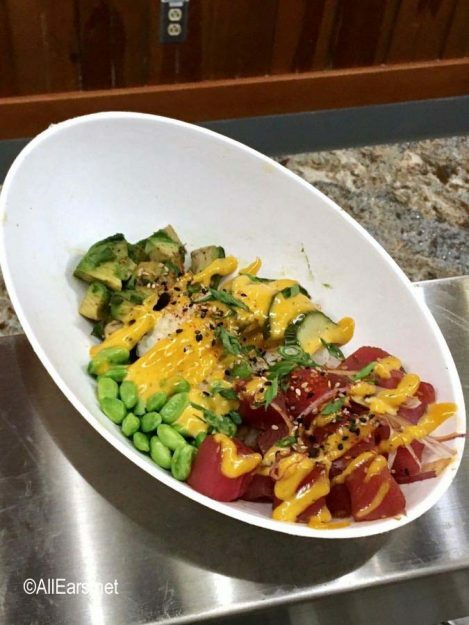 The menu offers a selection of items cooked to order such as artisan pizzas, skewers, fish tacos, nachos, and rice bowls. 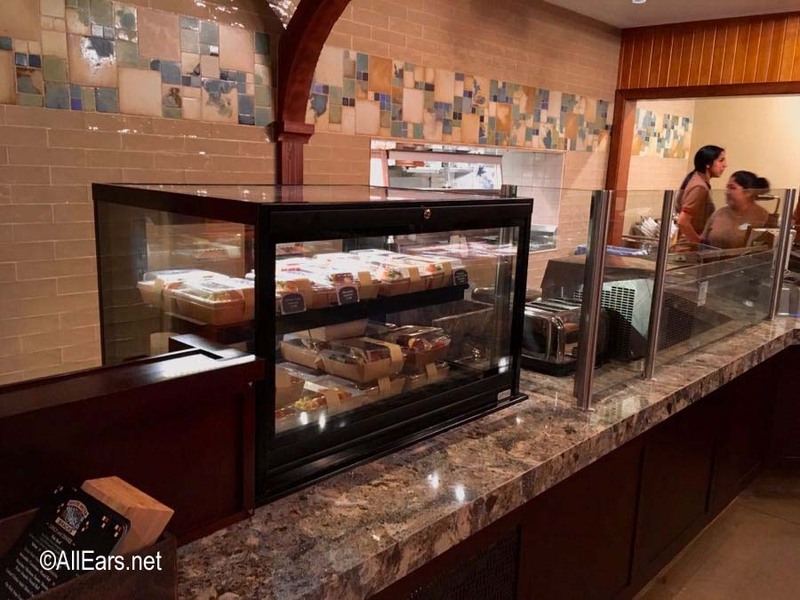 For a faster meal, grab and go items such as salads and sandwiches are also available. 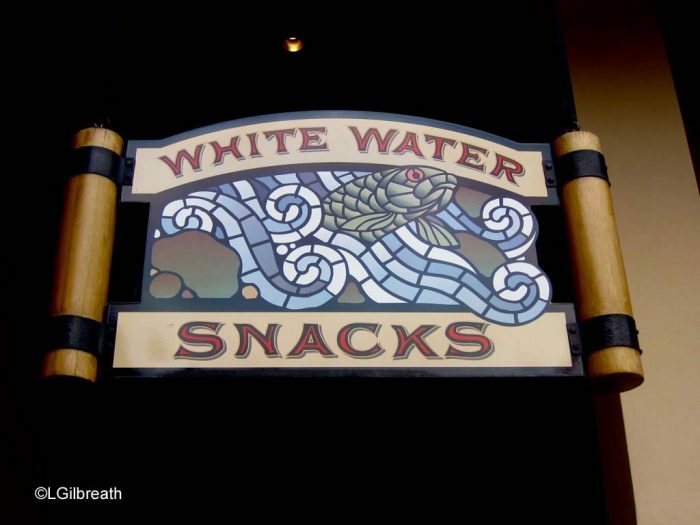 Mobile Order is now offered here, making White Water Snacks the first Disneyland Resort restaurant to offer that service outside the theme parks. Upon entering, there are tables with somewhat rustic looking displays of grab and go packaged food items. On the left are snack foods like chips, jerky, energy bars, fresh fruit, and cookies. 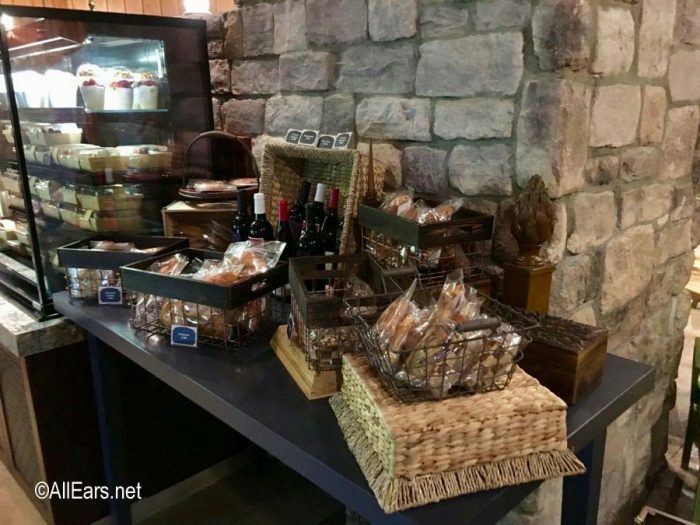 On the right are pastries such as croissants, muffins, and even more cookies, as well as a selection of red wines by the bottle. The refrigerated case on the right holds packaged salads, fruit plates, and parfaits. A new offering is a vegan-friendly chia coconut parfait. The vanilla yogurt, fruit, and granola parfait is also still available. Both are $7. 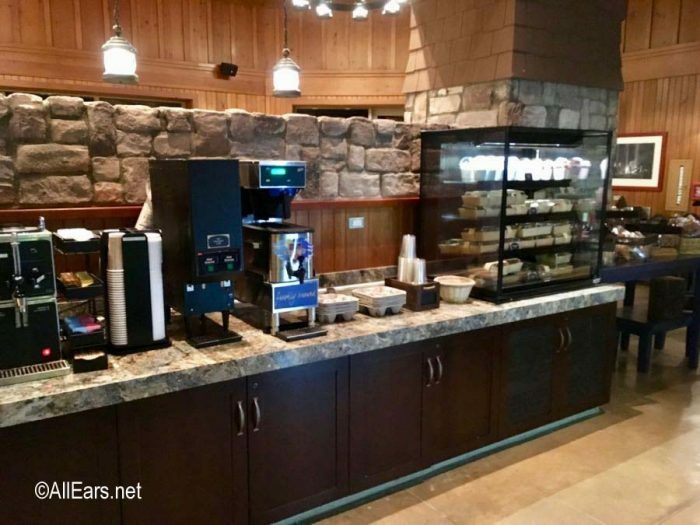 This counter also offers self-serve hot beverages, including coffee, tea, and hot chocolate. 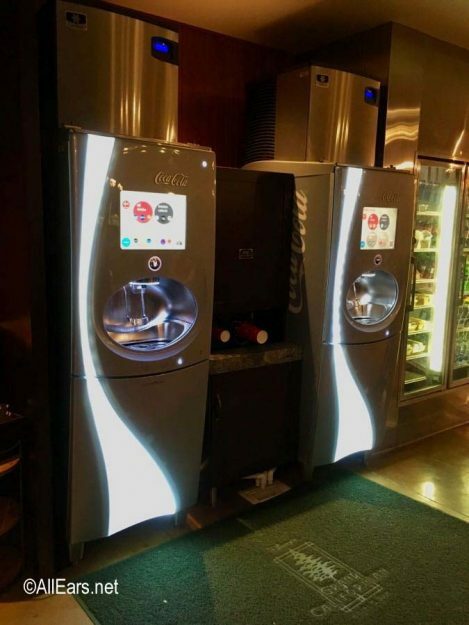 A pair of Coca-Cola Freestyle machines are on the left. Beverages are $3.99 for a regular size and $4.19 for a large. In the refrigerated case beyond is an even larger selection of bottled beverages, including milk, juice, energy drinks, beer, white wines, and sparkling wine. A grab-and-go sandwich case is placed beyond the Freestyle machines. The current sandwich offerings are mortadella, chicken curry salad, and prosciutto, lettuce, and tomato ($13-$14). New menu items include a Poke Bowl (choice of tofu, salmon, or tuna, $12), Avocado Toast ($14), and Chicken-fried Brisket & Waffle ($18). 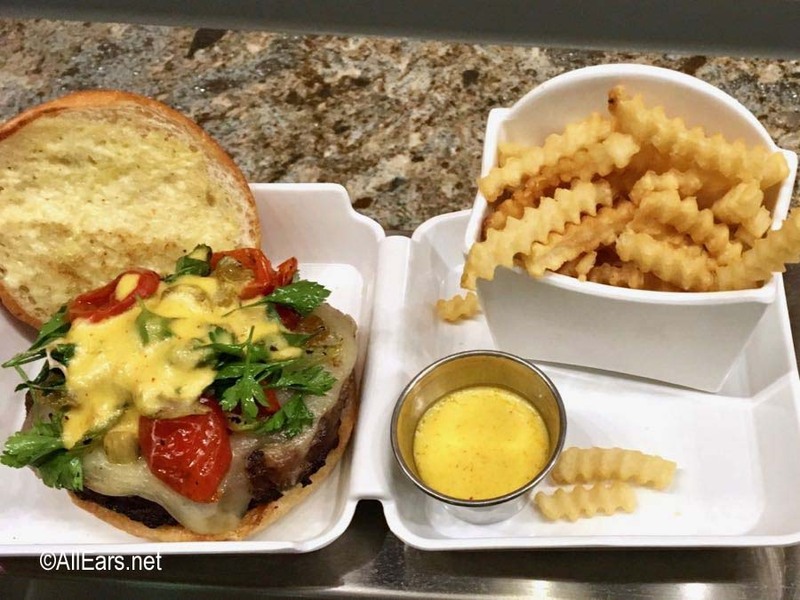 The Cali-Grilled Angus Cheese Burger ($15) is covered with spiced hollandaise, grilled asparagus and celery salad, and artichoke aioli. Another new offering is a Rice Bowl ($14) with choice of beef of chicken, served with vegetable egg roll and hard-boiled egg. The breakfast menu is quite different now, though the American Breakfast and Breakfast Burrito are still available. New items include a Smoked Salmon Bagel Sandwich ($16), Roasted Vegetable or Three-Cheese quiche ($10), and Belgian Waffle or Biscuit French Toast ($13). 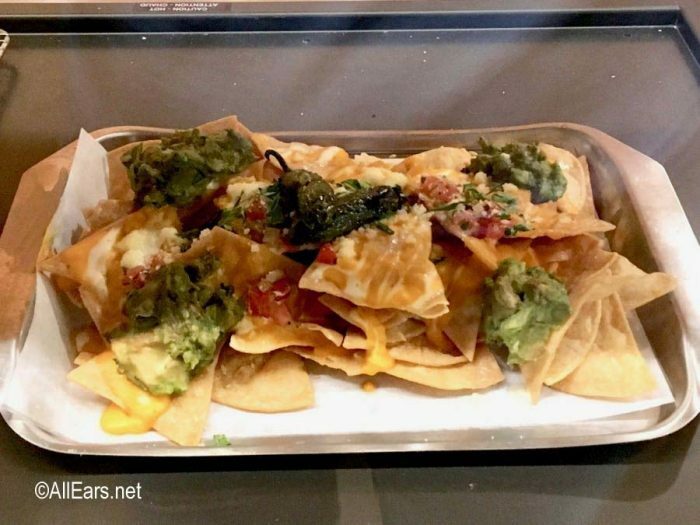 Breakfast prices are significantly higher – $13 for the American Breakfast and the burrito which were $9 and $8.50 previously. The order process is unchanged – requests for made-to-order items are placed at checkout. 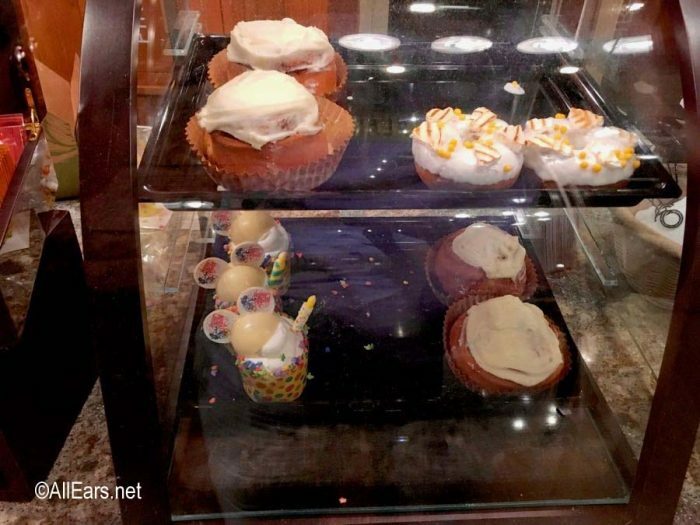 Also conveniently placed at checkout is a display with a tempting selection of sweet items like cinnamon rolls, doughnuts, and cupcakes. A root beer float or a seasonal crostata can be ordered off the menu. 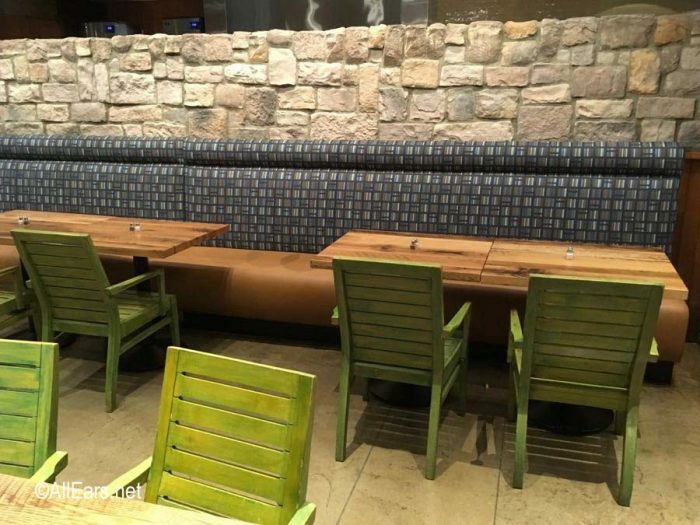 The seating area has been refreshed but not changed very much. 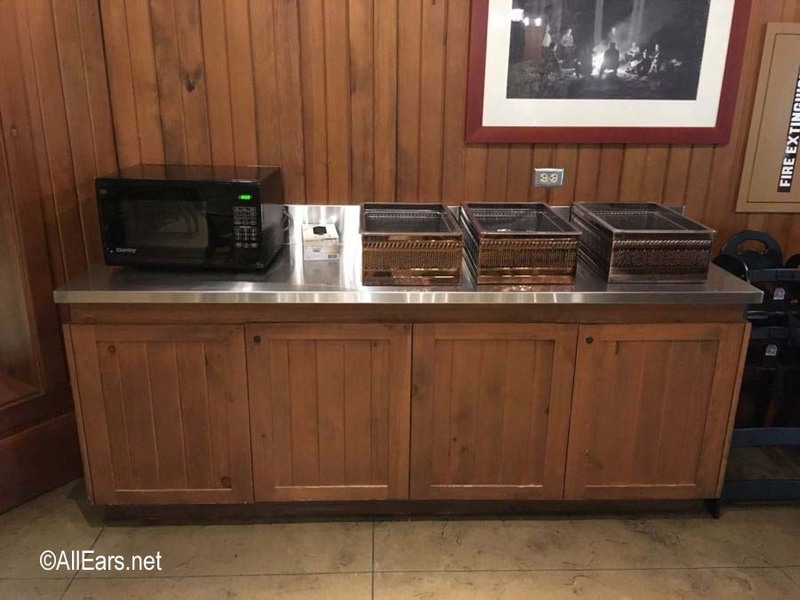 A microwave is available in the seating area, as well as condiments, etc. 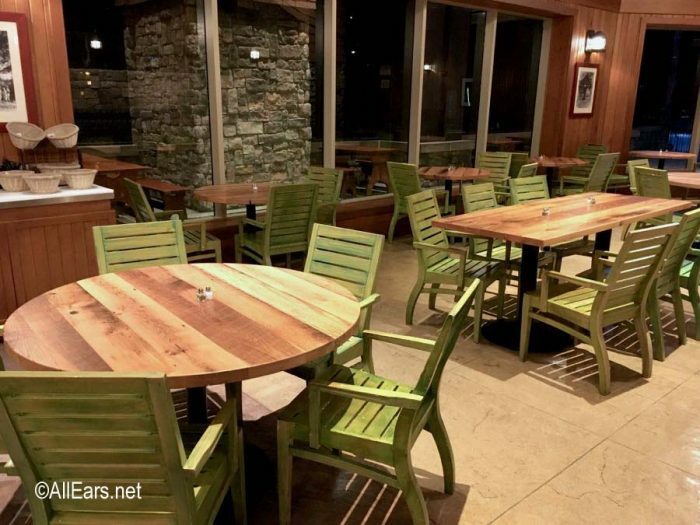 There is also seating on the patio outside. 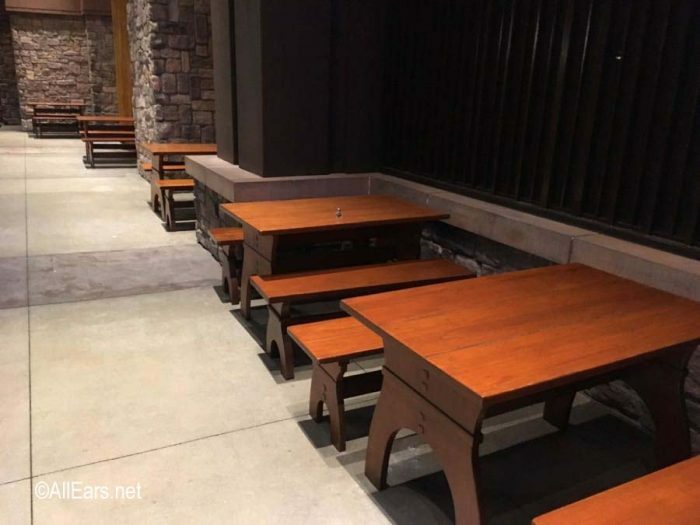 This area features picnic-style tables with benches rather than chairs. This corner location looks into Disney California Adventure park near the entrance to Grizzly River Run. 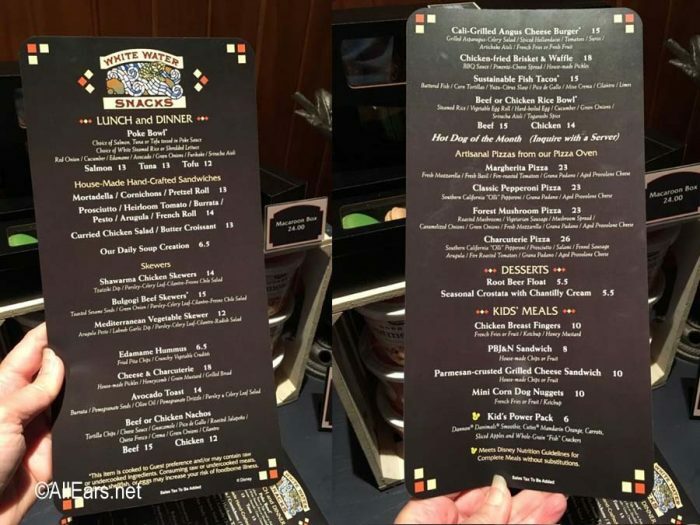 I haven’t had a chance to try any of the new menu items yet, but there’s several I have my eye on. One of my complaints about this restaurant in the past is that it really hasn’t been “quick service. 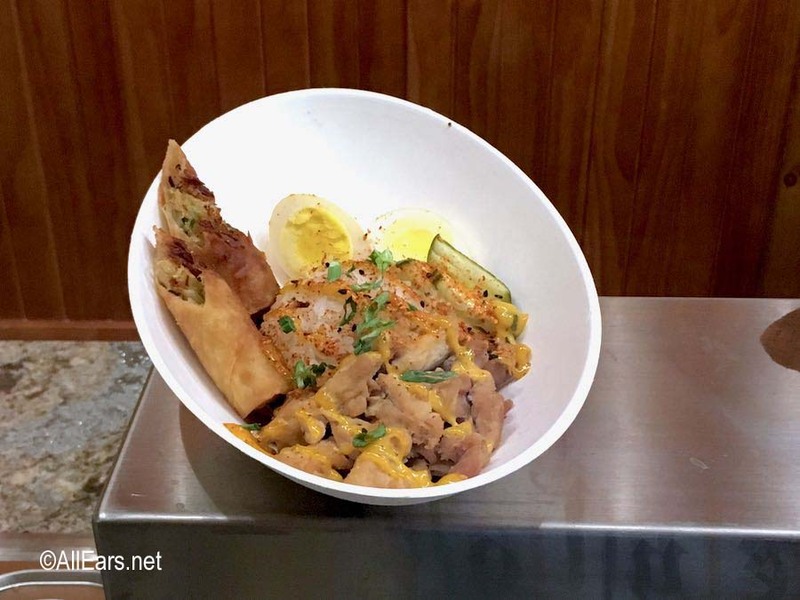 The kitchen has been slow – after ordering it takes a long time to get the food. It will be interesting to see if Mobile Order helps that at all. Have you sampled any of the new offerings at White Water Snacks? What do you think of the new menu?